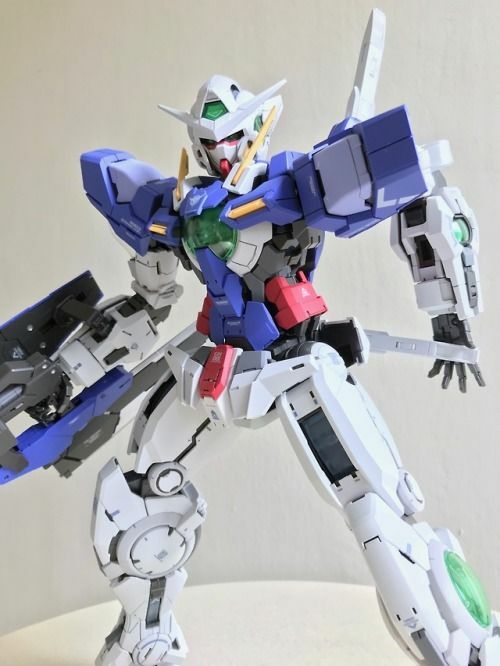 Best perfect grade kit so far? Quite possibly so. 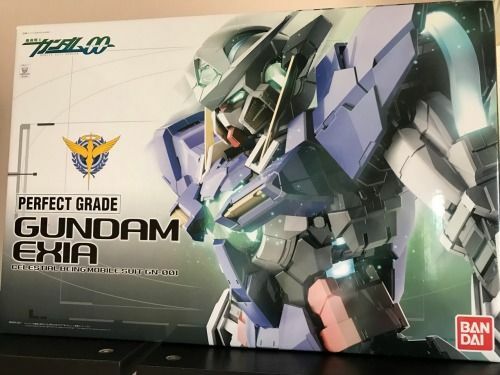 Almost every review online covers the “lighting” version of this kit, and I too was keen on getting it, until I found out that the non-lighting version costs about half the price. Furthermore, I got mine at an even lower deal that was too hard to resist. This version is for those who can’t justify paying double the amount for a feature that they’ll admire only ever so occasionally once it’s set up and on display. 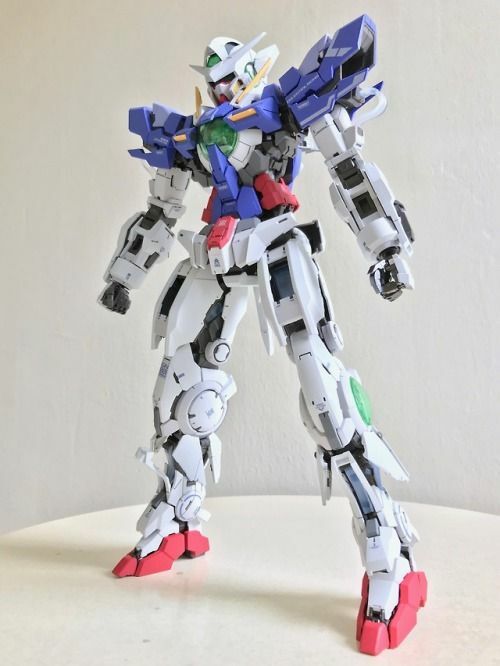 Apart from the “hi-res” 1/100 Gundam Barbatos, this is the only kit I’ve encountered where the entire inner frame had to be constructed before layering on the armour pieces. 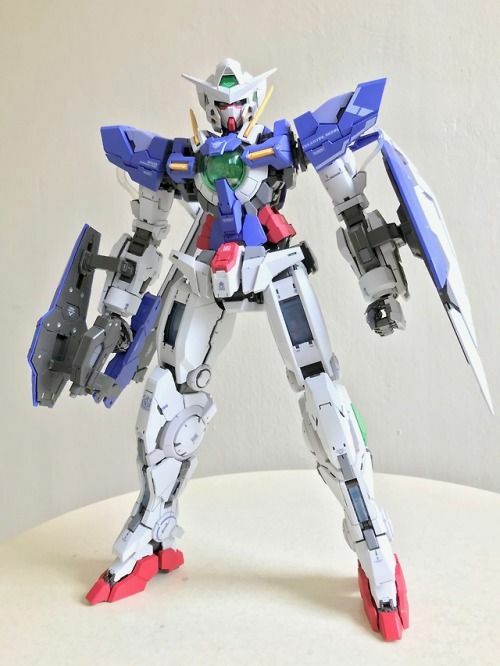 I find this somewhat a more refreshing and enjoyable build compared to assembling the entire torso, limbs, and head separately before putting them together. 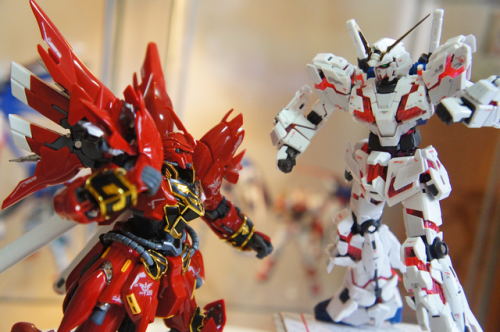 In a sense, it might be more realistic when we imagine how mobile suits are built in reality. 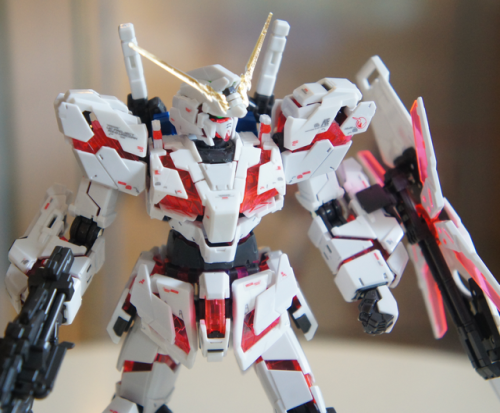 This method also allows us to appreciate the beauty and complexity of the inner frame. 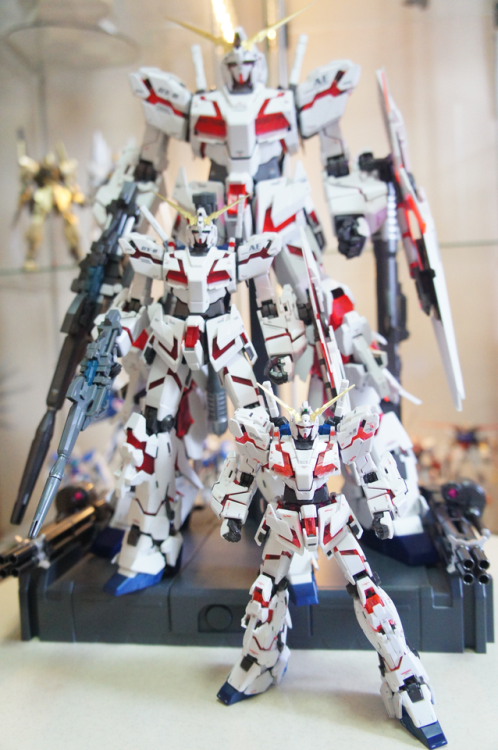 Since there’s no wiring up in this kit, building it was generally a breeze. 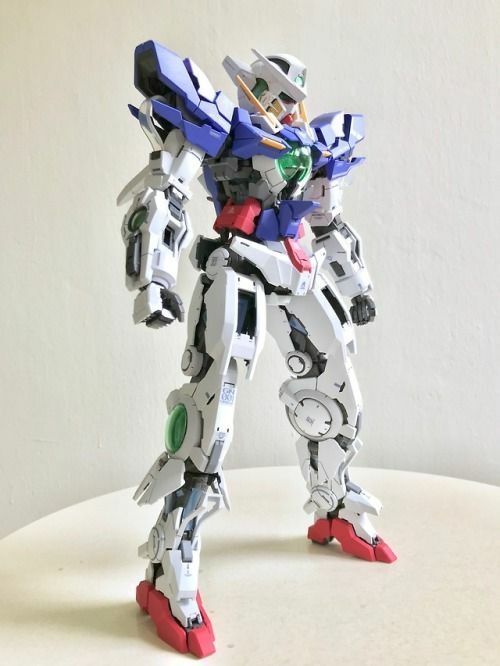 The only other Exia I’ve ever built and owned was the RG Exia in early 2014. 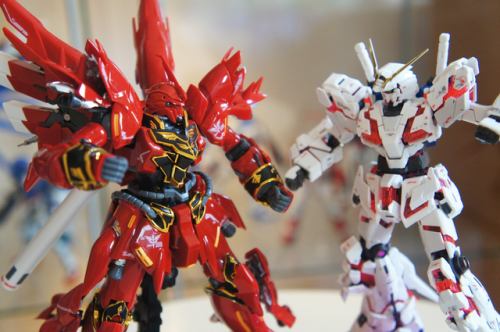 I placed both the RG and PG kits side by side and really got to appreciate what each grade had to offer. 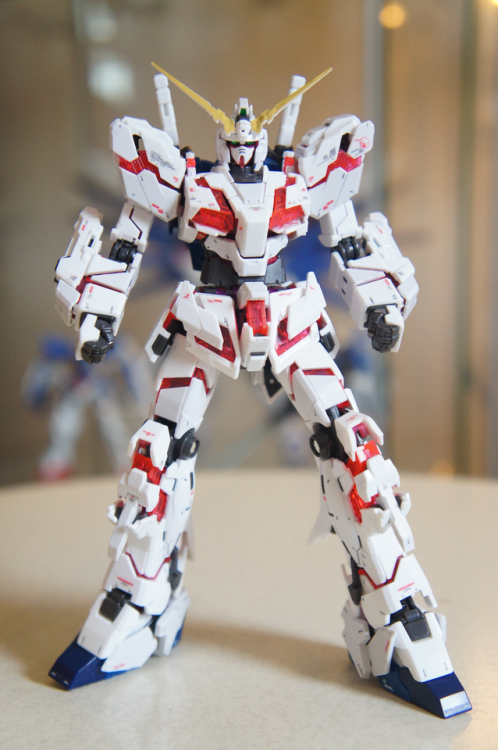 The proportion and details on the PG is immaculate, and phenomenal. 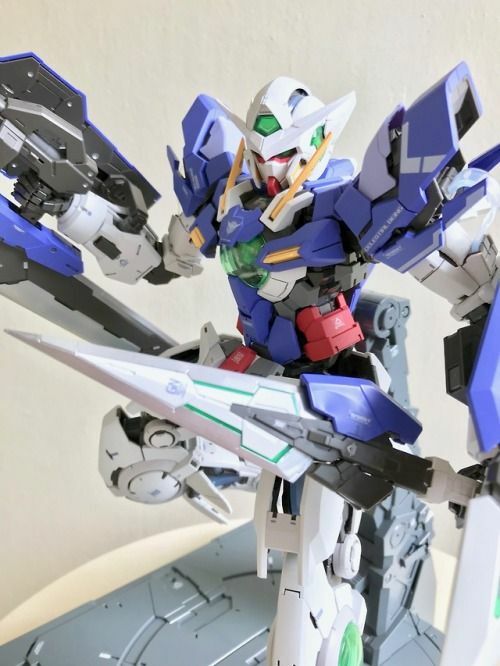 There are 2 shades of blue and white on the PG Exia and the blue appears to have a more purplish hue compared the RG (and presumably the MG) version. Just like some of the earlier PG kits, this kit also features an open hatch “gimmick” showing some parts of the inner frame and so provides us an additional option to have this model kit displayed. 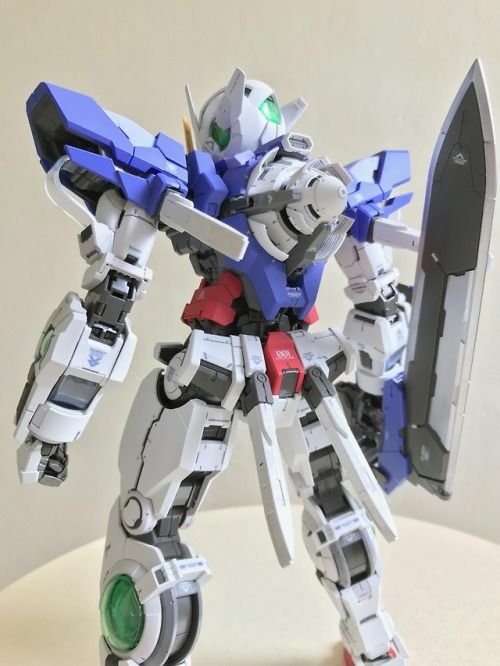 I did also notice that parts of the GN condensers which are visible on the inner frame of the upper arm and thigh areas end up being covered by the armour parts. This might be a minor issue for those building the lighting version as the number of possible lighted areas become obsolete when covered up. 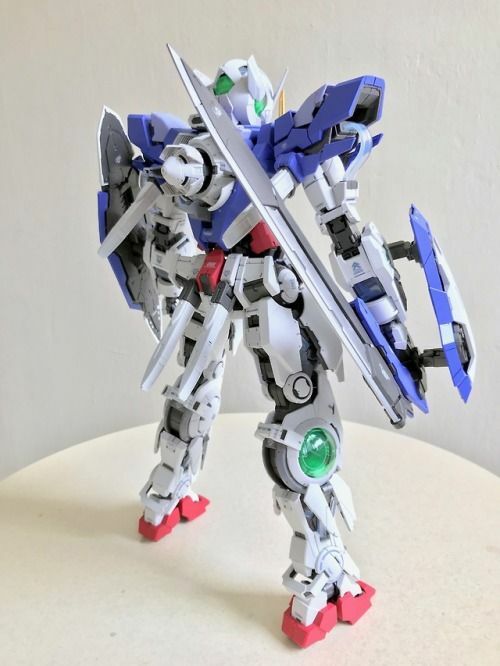 As for the accessories, while the RG Exia had its GN sword and blades in a mirror-like chrome finish, the PG Exia’s blades have a more subtle matte-silver finish. Some may prefer one over the other but I find the matte-silver choice looking really good as well. Almost perfect score here, let’s see why. The good: great range of motion in generally every joint. 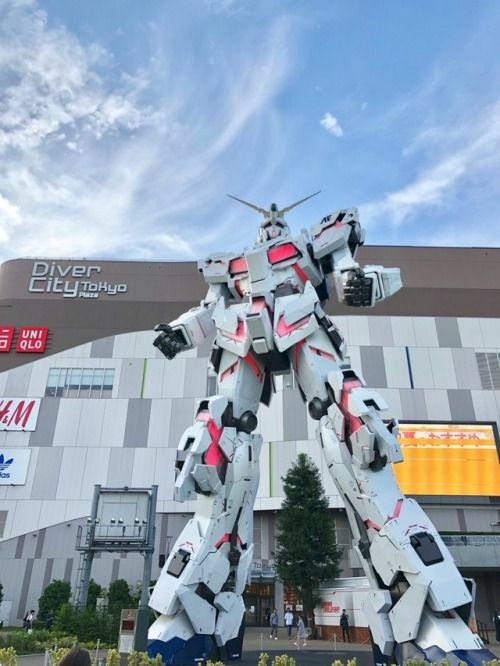 The elbows and knees are double jointed, and there’s no need to worry about breaking or squeezing any of the LED cables when fiddling with the joints since there are no electronics to deal with in this case. 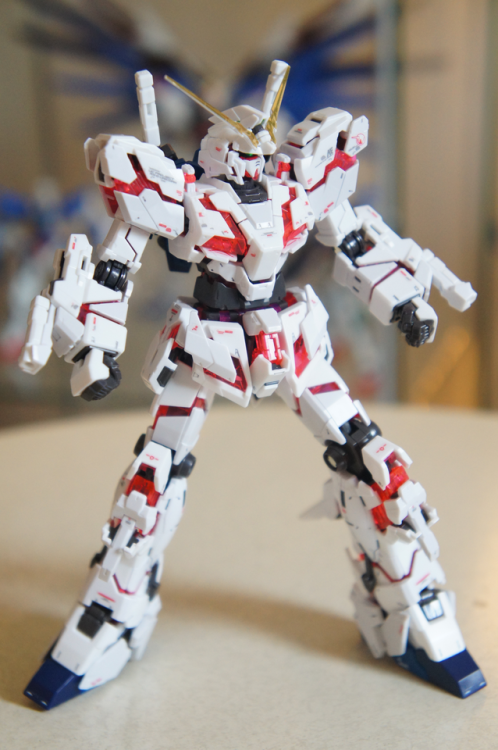 I did find a couple of minor issues with the articulation in the shoulders and upper-leg-hip joint. 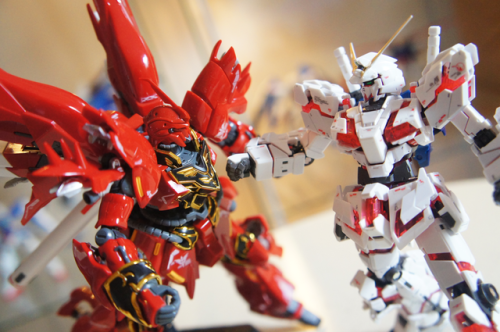 I found The shoulder joints particularly tight, which can be both a good and bad thing. 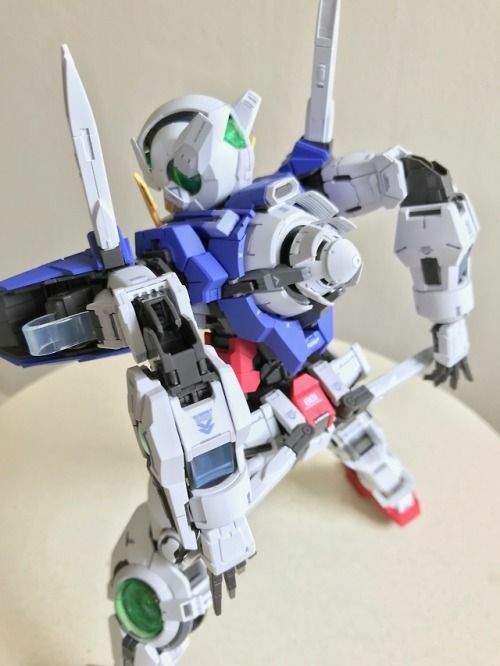 As I tried raising the arms up, I noticed that the the upper arm area of the inner frame looked somewhat stressed and slightly bent and I was concerned that it would snap. Raising it up and and down required quite a bit of force and care. As for the leg-hip ball joint, I thought it could have been a little tighter. 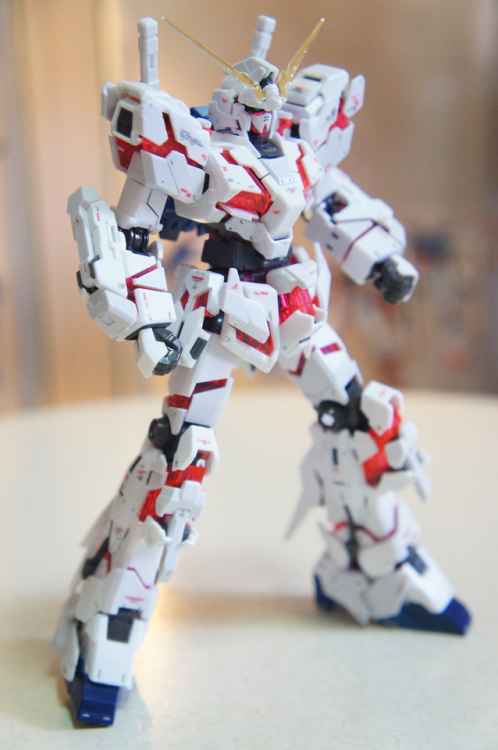 While posing the kit with its legs slightly apart, the upper torso started to weigh it down a little causing the kit to do a mini split before it stabilised midway. Nevertheless, these are minor issues that can be easily overlooked. What I really appreciated was the use of multiple hand options for different poses that can be easily interchanged with one another, without being loose in any way. 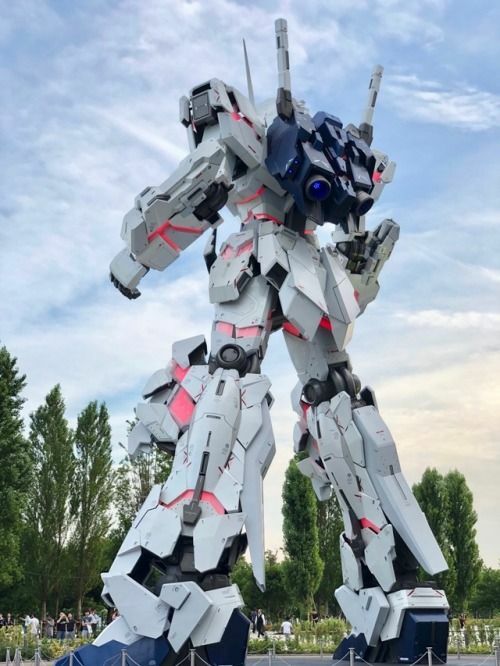 Great kit, highly recommended for gunpla or Exia fans as this piece would surely stand out as a mech display centrepiece. 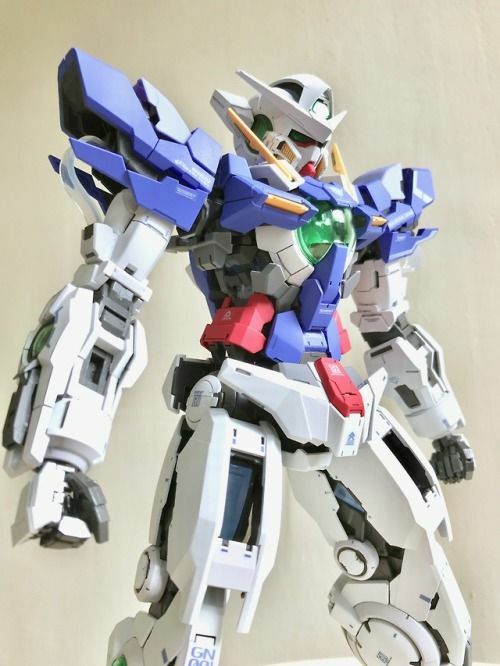 Assembling the PG Gundam Exia this week. Got the non-led version for a good deal, but kinda envious whenever I see the lighting version from reviews online. ​The lighting effects are really beautiful but I can’t justify forking out double the price for a feature I’ll only admire once in a while. I’ll most likely share my reviews when I’m done. 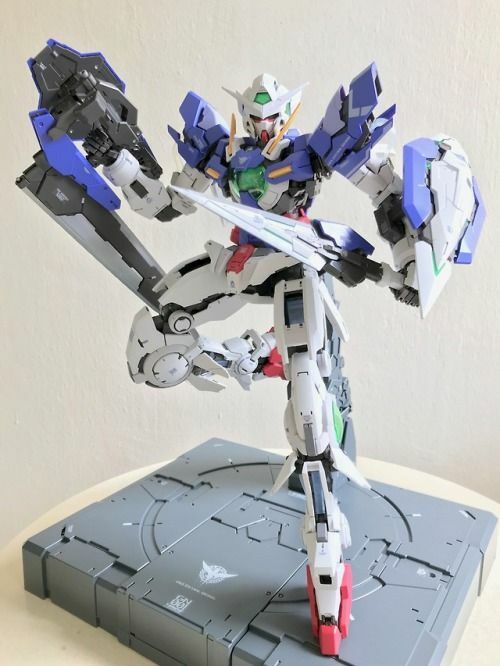 I’m really excited to see what poses I can do with this kit, compared to the PG Unicorn.